Automotive detailing is comprised of the thorough cleaning, restoration, and finishing of an automobile’s interior and exterior, with the goal of producing show-quality detail. Automotive detailing schools will teach you how to produce show-quality detail for both the interior and exterior of a vehicle. Interior detailing typically involves deep cleaning a vehicle’s interior cabin, including its carpet and upholstery, removing stains, steam cleaning, and treating leather upholstery. Exterior detailing includes tasks such as treating chrome trim, cleaning wheels, tires, and windows, and treating all visible exterior components. The automotive detailing courses you take while earning your automotive detailing degree will give you the skills needed to produce show-quality detail, with the goal of exceeding the vehicle’s original condition. Automotive detailing degrees are often offered by dedicated automotive detailing schools, but you can also take automotive detailing courses at technical and vocational colleges. Individuals with automotive detailing degrees are highly sought after because of their ability to reverse and prevent the signs of aging, which in turn can turn a low-quality vehicle into a high-quality, show-ready automobile. Earning your automotive detailing degree from an automotive detailing school, or developing detailing skills by taking automotive detailing courses at a technical or vocational college, will improve your employability and enhance your opportunities for future career advancement. Specialized automotive detailing schools often offer short, highly-focused automotive detailing courses aimed at improving your skills in a specific area of automotive detailing, such as polishing and buffing, headlight restoration, and windshield repair. Your automotive detailing courses will also cover topics such as used vehicle exterior reconditioning and vehicle paint service repair and reconditioning. Some specialized automotive detailing schools offer programs that can be completed in less than a week. In addition to preparing you to work for an established auto body repair shop, you can learn to start your own automotive detailing business while attending automotive detailing school. Automotive detailing degrees often contain business courses aimed at educating students on the basics of starting their own business. Automotive detailing schools offer programs that focus on hands-on learning. Approximately 85% of your automotive detailing degree will take place in the shop gaining practical experience. This practical experience will help you earn your industry certification after you graduate from automotive detailing school. Admission to specialized automotive detailing schools is often voluntary. If you are an established automotive detailer or mechanic and you want to improve your skills, this may be the best option for you. 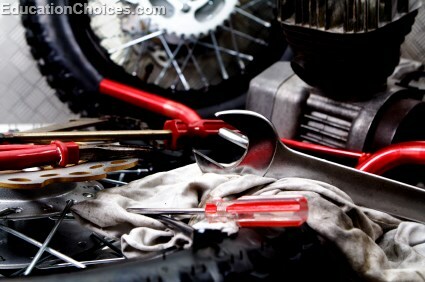 However, admission to technical or vocational colleges offering automotive detailing courses as part of a larger automotive repair degree is more difficult. Admission to these schools requires a high school diploma, and often requires you to be registered as an apprentice with your regional governing body. It is recommended that you thoroughly research admission requirements to technical and vocational colleges before you complete your application. Automotive detailing school graduates can expect to earn an average annual income that ranges between $21 000 and $36 000. Your annual income will depend on where you choose to live, whether you choose to work for an established auto body repair shop or auto dealership, or whether you choose to start your own automotive detailing business.